We offer classes for every level, ages 11 and up. Each class is limited to 7-11 people (depending on the class) so everyone has their own hammock. Please read the class descriptions & pre-requisites to see which is the best class for you. We look forward to seeing you in class! 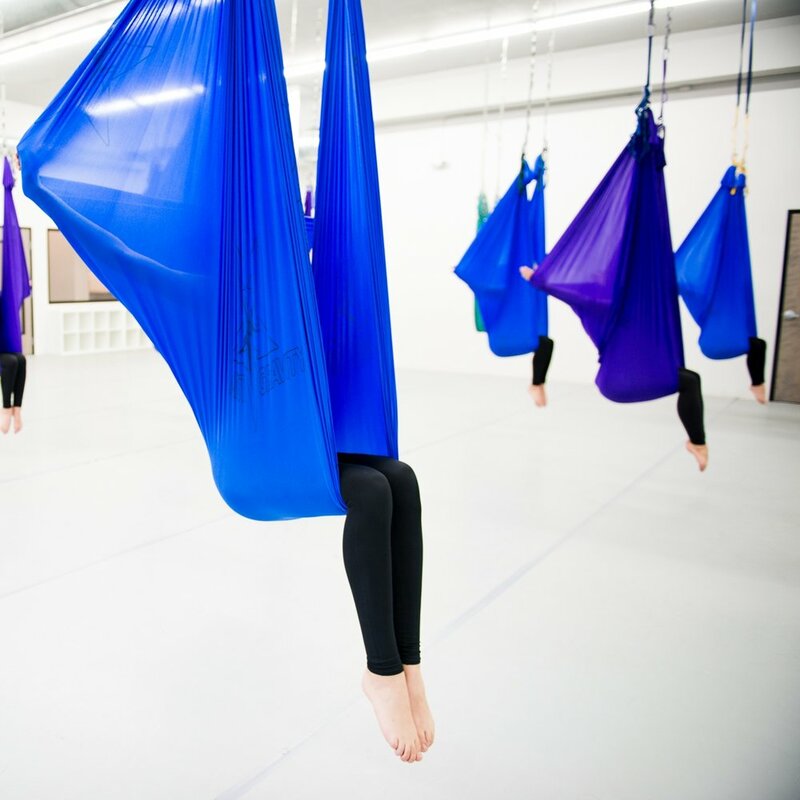 Fundamentals is an introductory AntiGravity® class most suitable for beginning students, but open to all. Here you will discover the excitement and pure joy of moving freely in all directions of open space. One will become familiar with the Christopher Harrison AntiGravity Hammock and the new sensations associated with inversions and flying, while building knowledge and foundational movements essential to progression in the movements are broken down incrementally, incorporating zero compression inversions, suspended stretching and fun! Level : No yoga or aerial experience needed–this class is perfect for the complete beginner. This class is appropriate for anyone whether or not you have previous yoga experience. Gain strength in your yoga practice as you challenge yourself to stretch further and attempt more difficult positions with the assistance of the Harrison AntiGravity Hammock. Explore the evolution of yoga into 3-dimensional space through this mind/body/spirit class where you will lean to execute challenging flying asanas and vinyasa variations. Tuesday morning & Thursday Evening Classes (Intermediate-Advanced). 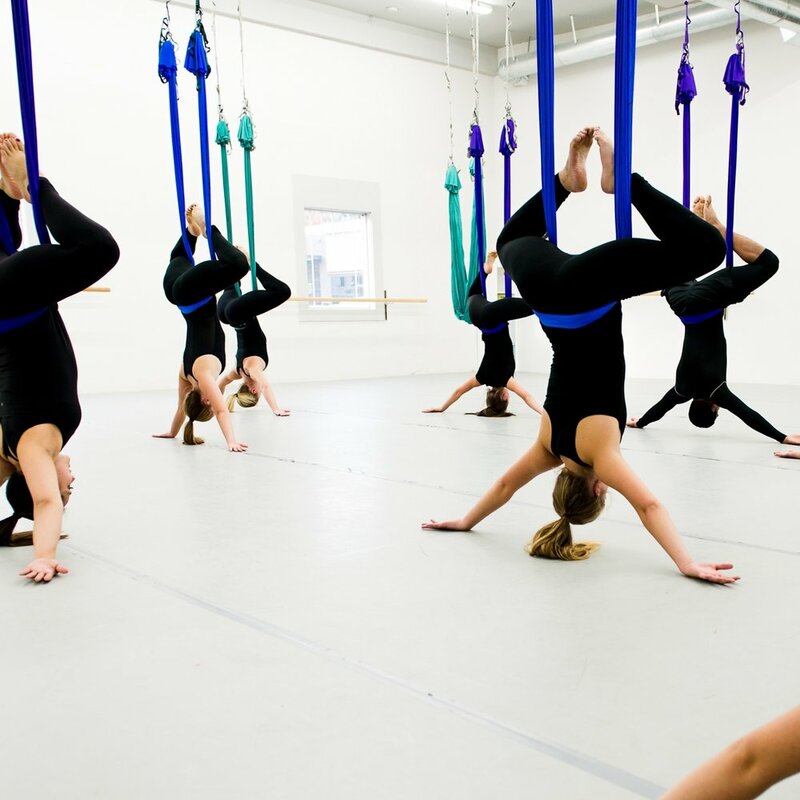 These Aerial Yoga classes are challenging classes for intermediate-advanced Antigravity Aerial Yoga students. You should be able to move in and out of inversions without direction or assistance. If you are not at this level please check out our fundamentals, open level, or restorative classes. Regardless of your Yoga, dance, pilates, etc. experience, prior Aerial Yoga experience is necessary. If you do not have prior Aerial Yoga experience we reserve the right to ask you to leave. Thank you for respecting this requirement so we can provide the best environment for our students and staff. 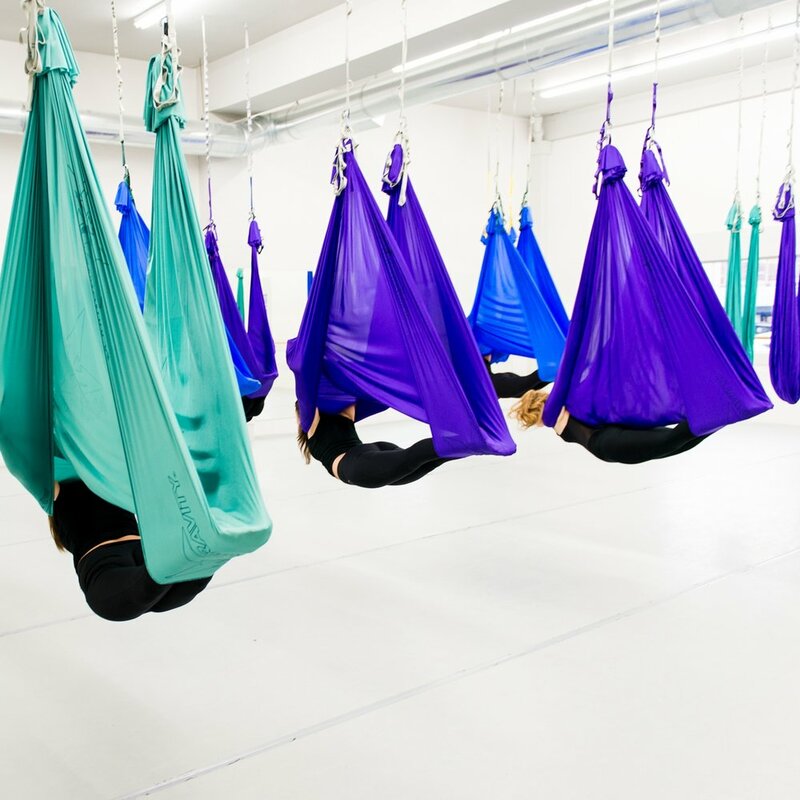 Elevate your workout, burn calories and raise your mood in AntiGravity® Flying Fitness! Utilizing the AntiGravity® Hammock, this class builds strength and agility with advanced inversions and new flips and tricks! Increase your kinesthetic awareness for better agility, build core strength, elongate your muscles and get a low-impact cardiovascular workout while suspended by the Harrison AntiGravity Hammock. Level: Intermediate-Advanced We recommend taking at least 3 AntiGravity® Fundamentals classes. This Aerial Yoga class is a challenging class for intermediate-advanced Antigravity Aerial Yoga students. You should be able to move in and out of inversions without direction or assistance. If you are not at this level please check out our fundamentals, open level, or restorative classes. Regardless of your Yoga, dance, pilates, etc. experience, prior Aerial Yoga experience is necessary. If you do not have prior Aerial Yoga experience we reserve the right to ask you to leave. Thank you for respecting this requirement so we can provide the best environment for our students and staff. This technique features full body inversions, alongside various forms of flowing spinal traction. It offers accessibility to students with physical limitations, but is loved by all as a portal into deeper spinal flexibility, and mind/body connection. Working from different hammock heights allows for the gentle opening of hips and spine. 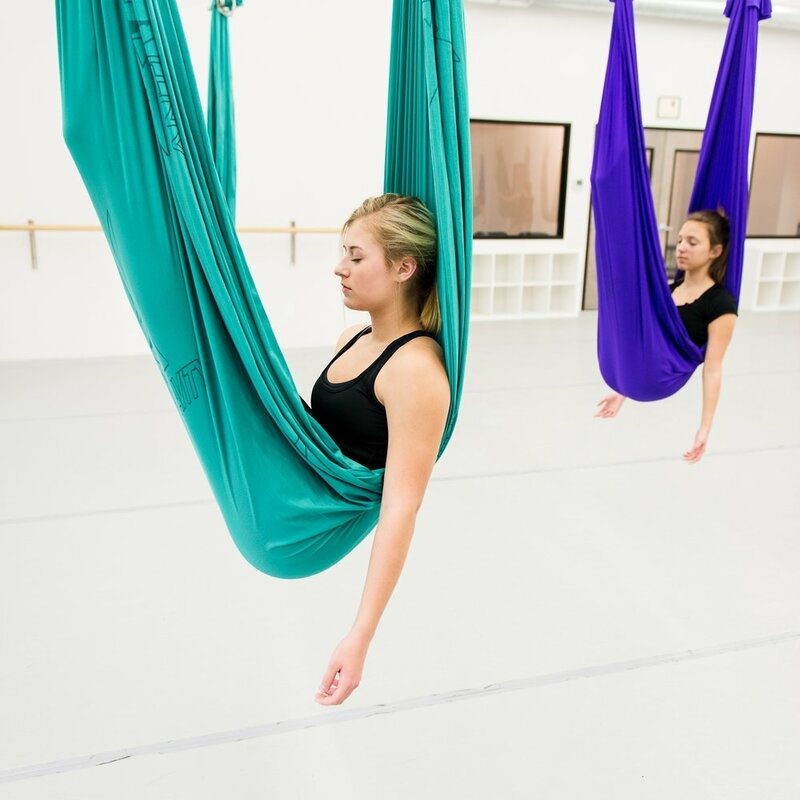 AntiGravity® AIRbarre is a fitness technique that transfers dance conditioning and exercises at the ballet barre to the AntiGravity® Hammock. Develop strength, length and grace while realigning the whole body. Ideal for all fitness levels who want to look, feel and move like a dancer! Christopher Harrison, the award-winning choreographer who brought the aerial arts to Broadway, is proud to announce AntiGravity® AIRbarre! This extensive aerial dance conditioning program is the newest aerial fitness technique to come out of AntiGravity® Fitness, the Originators of the Suspension Fitness and Aerial Yoga genres. Come and fly with your friends! Make your next party extraordinary with a private Aerial party. From birthday Parties, Bachelorettes, fitness groups and corporate outings, we'll design the perfect private class for you. Be sure to read the Studio Policies & review the FAQ section of the website. Please arrive 10 minutes prior to your first class to be measured for your hammock. Any participants who are under 18 years old, must have a parent sign our Waiver prior to their first class. Attire: Wear workout wear that covers the shoulders (Short & long sleeved) and legs. Cotton or Cotton blend fabric is best (not-slippery). Tops should be either fitted or not too loose. Remember, you will be upside down. Please make sure that your bottoms are not see through. No socks (unless they are sticky). ABSOLUTELY NO JEWELRY MAY BE WORN. $150.00 for a 1hr session / maximum of 10 participants. Payment must be made 2 weeks before the class to hold your spot. Sign up with your email address to receive news, updates, and class specials. Located at Virtuosity Performing Arts Studio/VEGA in Downtown Camas, Washington. Just 10 minutes from I-205. Thank you for your message! Someone will be in contact with you soon.